Some vehicle buyers are focused on factors like style, reliability and performance when making their decision, but for many the primary factor is that the vehicle must meet their people-hauling requirements. Many need a vehicle that is capable of seating 7 or even 8 passengers to accommodate a growing family, their kids’ friends, lots of cargo, etc. A minivan is one option, but many buyers today are shying away from the minivan and are opting for an SUV with 3rd row seating with a sleek exterior and superior power and handling. In addition to the sortable table below, we have written in-depth reviews on the top options that are summarized below. The reviews outline and compare the safety, performance, cargo and passenger space, warranty information, fuel economy and other features that come standard in the models. You can easily narrow down your search for your next vehicle when you spend time focusing on the following 5 models on the market for 2017. Enter a term in the search bar to narrow down your results. Hold shift to select and sort multiple columns. “std” means that number of seats comes standard. “opt” denotes that the capacity is available as an option. The “3rd Row Room” column outlines the Head/Leg/Shoulder room in inches. One of the best overall picks for 2017, the Honda Pilot is once again a top performer in the mid-size SUV class. Sporting three rows, AWD options, a long list of tech and safety features, and Honda crafted reliability, the Pilot earns itself a look from any SUV buyer seeking the best. Largely unchanged from the 2016 model year, the Pilot benefits from lots of space, great design choices, and an inexpensive starting price. Powered by a 3.5L V-6 and mated to either a 6- or 9-speed automatic, the Pilot never feels short on power. The 9-speed transmission is still new and can sometimes get confused when switching gears, but it does function well enough to be usable. This year Honda offers a terrain management system in most of the available trims, allowing drivers to select a driving mode based on the terrain they are tackling, forcing the drivetrain to adapt to the new road condition. Offered in both FWD and AWD models, the AWD will handle very light off-roading without too much trouble thanks to lots of ground clearance. It will even handle a bit of towing, rated for up to 5000 pounds when equipped to do so. The most welcome changes for the 2017 model year may just be in the Pilot’s interior. Small tweaks to the interior surfacing removes many of the “cheap” feeling materials in favor of more soft-touch surfaces, giving the Pilot a much more upscale feel than previous years. There’s a surprising amount of room and plenty of comfort in the Pilot’s three rows of seats, even managing to provide a usable third row, something that’s almost unheard of in mid-size three row SUVs. One of the only three-row SUVs sold with a Hybrid option, and by far the least inexpensive three-row Hybrid SUV, the Toyota Highlander Hybrid offers drivers interested in a hybrid electric-drive vehicle a sensible choice in the ever growing hybrid market. 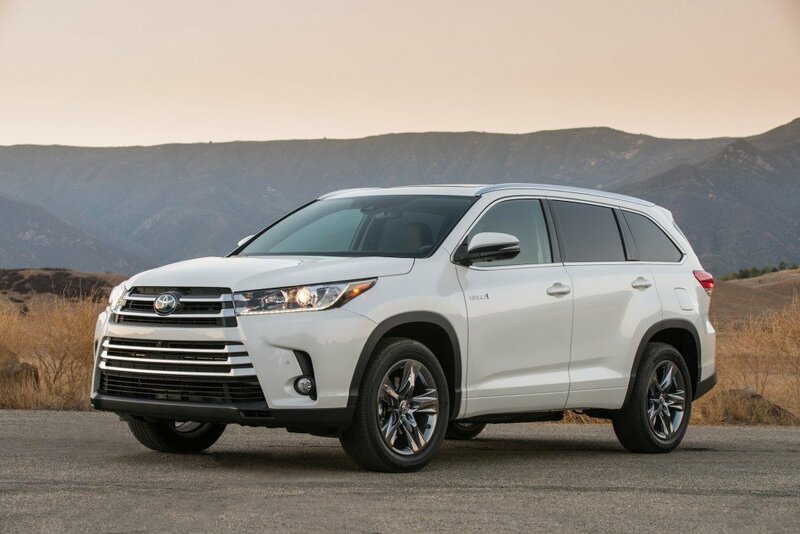 Built on the already stellar Highlander chassis, the Highlander Hybrid has plenty of space, great fuel efficiency, and Toyota reliability, all with an entry price of almost $10,000 less than its competition. The same 3.5L V-6 from the base Highlander is present in the Hybrid, paired with electric motors that bring the Highlander’s total available power to 303-hp. A CVT automatic and AWD come as standard, and the Higlhander Hybrid gets a combined 30 MPG. Seven seats are standard in the Hybrid, with an available option for eight. There’s plenty of room in both the first and second rows, with the third row being usable by adults on short trips. It’s a great interior that provides a lot of comfort and accessibility, with plenty of USB charging ports and padding in the seats. 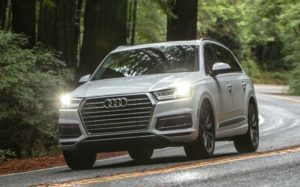 Audi makes performance vehicles made for driving enthusiasts, and the 2017 Q7 fits perfectly into this design philosophy. A luxury SUV made with driver enjoyment in mind, the Q7 pairs exquisite comfort with raw power and performance to produce an SUV worthy of the Audi badge. A supercharged 3.0L V-6 sits underneath the hood of the Q7, making 333-hp and 325 lbs-ft of torque. It has ample acceleration at all points in the power band and feels quick and responsive regardless of driving conditions. 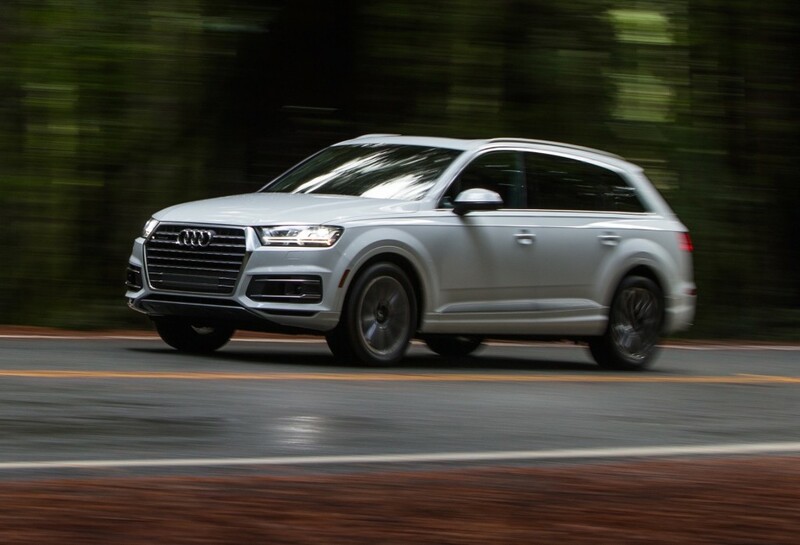 Audi’s signature AWD system brings power to all four tires and an advanced suspension ensures the Q7’s ride is not only comfortable but safe, too. Driving the Audi feels like being in a much smaller, more agile vehicle than the SUV’s large size would imply. The first and second rows in the Q7 match any other manufacturers level of comfort, and while the third row is best reserved for children due to lack of legroom, all passengers will enjoy a smooth ride on almost any road surface. A multitude of tech and safety options are available as both standard and optional extras, but the most advanced safety features are only available on the highest trims – with a price to match. Tesla’s Model X is an eco-friendly SUV with enough power to make most sports cars jealous. It sports the latest electric-drive technology paired with exorbitant luxury accommodations and a price tag to match. Even in its least expensive trim, the Model X still edges close to the $100,000 mark. Four electric motors propel the Model X forward at blistering speeds. The base Model X, the 75D, will do 0-60 in just 6 seconds. More expensive trims will cut this time to just 2.9 seconds, with a range of up to 289 miles. Not only is that faster than most supercars, it’s one of the longest ranges of any electric-drive production vehicle ever. Only one gear is found in the Model X’s transmission, and power is fed to all four tires via an AWD drivetrain. The Model X is not a large SUV, and the third row suffers for it. It’s barely usable, even by children. That being said, the front two rows are what would be expected from a luxury SUV and then some. Posh accommodations are the standard here, and a wealth of features help keep the Model X’s passengers entertained, including a massive 17.0-inch touchscreen infotainment system. The Model X is also one of the few vehicles on the road today to feature a fully-functional autopilot driving system. An inexpensive crossover that punches well above its weight class, the Kia Sorento gives spectacular “bang for your buck” value. It doesn’t excel at any particular area, but is well-rounded enough to be a comfortable daily family-commuter with an inexpensive base price. A 2.4L inline-4 paired with a 6-speed automatic makes 185-hp for the 2017 Sorento, the same engine it featured last year. It’s not overly quick, but it does suffice for daily driving needs. Kia offers two other engines, a V-6 and a turbocharged inline-4, and of the two the turbocharged 4-cylinder is the better option. It creates 240-hp and is much better equipped to handle a fully-laden Sorento. All engine options come with FWD as standard, with AWD as an option. Inside, the Sorento can be equipped with three rows of seating. There’s nothing too special about the Sorento’s interior, but it serves as a reasonably comfortable place for passengers. Oddly enough, the third row in the Sorento is more comfortable than the second. It has more legroom and more headroom than the comparatively cramped second row. Neither is ideal for long trips, but they will both work for short drives. The least expensive three-row SUV on this list, the Nissan Rogue brings comfortable accommodations at a low price point. Its biggest selling point comes in an abundance of space and utility, with three rows packed into a small frame and an adjustable second row. Where the Rogue begins to fall short is power and performance. The base models 2.5L inline-4 engine produces just 170-hp and is paired with Nissan’s CVT transmission. It suffers from a lack of acceleration, particularly when filled with people or cargo, and the only other engine offered is a hybrid-electric drive 2.0L that bumps available horsepower to 176. Both are passable as daily-commuter options. It handles well enough and Rogue gets credit for a very smooth and comfortable ride. The real highlight in the Rogue is first and second row seat accommodations, a category where it excels. The second row can slide forward or back, allowing variable legroom for passengers seated there. The third row is best left for children, lacking in both legroom and headroom. Acura’s 2017 MDX is a luxury SUV with the power to let drivers let loose in the corners. It’s one of the most comfortable and well-equipped models on this list, even in its base trim, and it can be filled with some of the most advanced driver-assist safety technology on the market today. Acura uses a 3.5L i-VTEC V-6 in the MDX that makes 290-hp and is paired to a new 9-speed automatic transmission. As with most 9-speed’s seen this year, it’s not perfect, but it does perform adequately in most driving situations. The MDX can be driven in a full-manual mode, allowing drivers to hold gears up and into the red-line. An upgraded AWD system and improved suspension keep the MDX planted on all four wheels, ensuring drivers stay in control even in tough conditions. Featuring a usable third row, luxury level comfort in the first and second row, and ample cargo space to boot, the MDX has one of the best SUV interiors out there. It’s also an IIHS Top Safety Pick+ and includes lane-departure warning systems, adaptive cruise control, and forward-collision warnings with automatic braking. The 2017 Santa Fe is a standout in the increasingly impressive Hyundai lineup. Aimed to compete with the likes of the Honda Pilot, the Santa Fe had to provide an all-around strong package in order to be given consideration over other vehicles in its class. Fortunately, it has been able to garner critical praise due to its competitive price, good looks, a spacious interior, and versatile utility. Hyundai offers only one engine for the Santa Fe, a 3.3L V-6 that peaks at 290-hp. It’s available in either FWD or AWD configurations and is paired with a 6-speed automatic gearbox. It’s more than enough for daily driving, and comes ready to haul up to 5000 pounds. The Santa Fe also benefits from a smooth ride and tight handling, and can even handle light off-road duty, another nod to its list of utility features. There’s a surprising amount of space in the Santa Fe in all three rows, with plenty of legroom in both the first and second rows, and even the third row can be usable, but it can be difficult to access. Lot’s of cargo room rounds out the Santa Fe’s spacious interior, and the third row can fold down to provide additional space. The Santa Fe also earned the IIHS’ Top Safety Pick+ award for 2017. 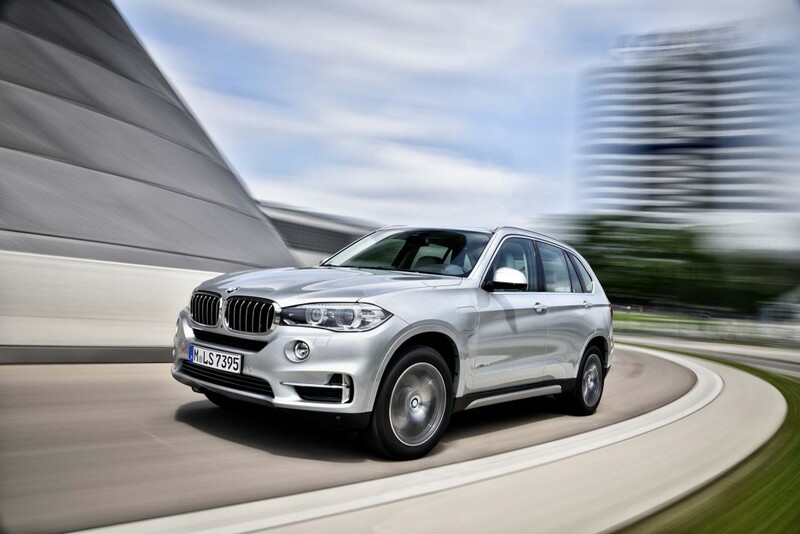 One of the fastest SUVs on this list, BMW’s X5 is a performance driving machine wrapped in luxury. 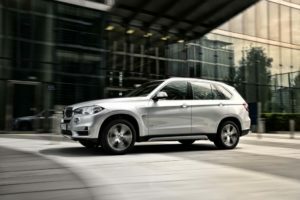 Made with driver enjoyment in mind, the X5 sports powerful engine options, an advanced suspension, and a tuned driving experience made to entice buyers who want an SUV that can double as a weekend sports-car. Like the Audi Q7, the base model X5 features a 3.0L V-6 under the hood, but this time it’s turbocharged and makes 300-hp. It’s available in both RWD and AWD configurations, and is paired to an 8-speed automatic. Even with this base engine, the X5 has plenty of power, but BMW offers several more options for drivers looking for something more sport oriented. A twin-turbocharged 4.4L V-8 is next in line, making 445-hp and a lightning fast 4.7 second 0-60 time. There’s also an M trim available with an even larger V-8 and a 4.0 second 0-60 time. It isn’t all about speed, however, and the X5 has an precision tuned suspension that enables it to handle like a dream. It doesn’t feel anything like a three-row SUV when driven, acting more like a sedan than a mid-size crossover on the road. Inside, the X5 will comfortably seat adults in the first and second rows. A foldaway third row provides seating for children or cargo space when stowed away. BMW offers a bevy of available extras, including night vision and a heads-up display, safety equipment, and road assistance upgrades. 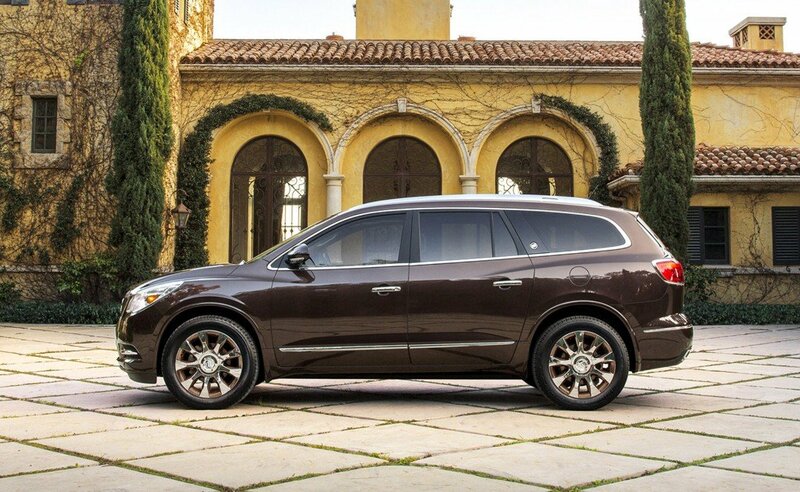 An older chassis that’s undergone a number of changes in recent years, the Buick Enclave is nonetheless a best-seller in the Buick lineup. It’s big on interior space and comfort, and despite its age still manages to look great. Little has changed in the Enclave’s powertrain for 2017, featuring the same 3.6L V-6 paired with a 6-speed automatic transmission. This is the Enclave’s only engine option and it produces 288-hp, offering both FWD and AWD options. It’s a big, heavy SUV and that can be felt in the Enclave’s handling. It’s less agile than some of its competitors and there’s significant body roll when changing lanes or cornering. That’s not to say the Enclave handles poorly; it’s just not as sporty as other SUVs of similar size. The Enclave is also thirsty for fuel, getting an EPA estimated combined 18 mpg in the FWD configuration. The Enclave’s strong suit is in its interior design. It has a usable third row and gives passengers great seating in the first and second rows. Captain’s chairs are standard for the second row, but a bench can be added instead. Both the first and second rows can be folded down for additional cargo space. Which of these SUVs are you leaning towards? Leave a comment and let us know what you like about it! Want more than the top 10? See the complete list of SUVs along with their fuel economy, capacity, rating and MSRP.